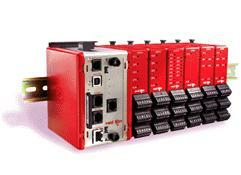 Red Lion offers a wide variety of 1/16 DIN and 1/8 DIN controllers, as well as DIN rail mounted models. All devices provide auto-tune for easy setup and an advanced control algorithm to limit overshoot. For simple multi-zone applications, the rail mounted Dual Loop Controller (DLC) is designed to interface via Modbus, DH-485 or DeviceNet, allowing easy connection to your control system. For more complex multi-zone applications, check out the state-of-the-art Modular Controller family of products. This device provides high loop densities, and more advanced communications options, including Ethernet. Up to 16 modules or 32 PID loops can be connected to one master controller! The system is configured using drag-and-drop software. Link to Red Lion's Modular Controller system.